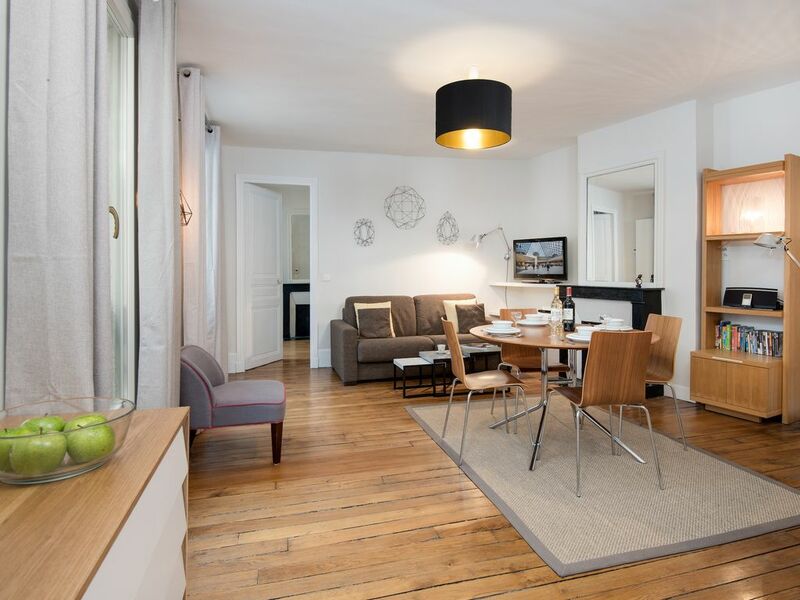 Fabulous Marais Luxurious one Bedroom ROSIERS. AIR COND. Price for 2 people. 100 Euros for 2 extra people more = 4 people. Gorgeous apartment totally renovated in an old building of one of the most famous area le Marais : FRANCS-BOURGEOIS and SAINT-PAUL. Very quiet, silent, and light with three huge windows, the studio views on a yard very calm and full sky. Building secluded with two safe code doors. A delicious place with absolutely no default. More pictures available about inquiry. Many testimonials upon inquiry. - Metro station : Saint-Paul. - Surface: 50m2. Main dining room with, table/chairs, TV, huge sofa/bed. Separate bedroom with queen bed, 160 cm. Kitchen. Bathroom. WC. - 3rd floor. THREE flights of easy stairs. no elevator. - Very sunny, clear and totally quiet with three huge windows. Through the window, view on the yard. - Kitchen fully furnished, microwave, toaster, coffee machine, washer/dryer, diswhasher, refrigerator, etc. - Queen-size double bed . - Housecleaning with new linen/towels every ten days included for a long-term rental (one month). Very nice flat in an excellent location. Le Marais is a charming quartier, with lovely cafés and restaurants. Thierry’s flat is well equipped and is very peaceful. We had a very comfortable stay and would definitely recommend it to anyone travelling to Paris. We loved Thierry’s apartment. We’ve stayed in the Marais before but never had such a quiet apartment. It’s in a great position, very close to the metro, shops, bars and supermarket. It’s very comfortable and has everything you might need for a happy stay. There are three flights of stairs which can be an issue sometimes when you’re tired after a big day of sightseeing but that is balanced by the number of pastries you are allowed to eat to make up for them! The apartment was fully supplied with every need . I can't say enough about this apartment. Thierry is so lovely, and the location is fantastic. The elegant Place des Vosges is literally around the corner, with shops and cafes galore. The apartment is just as described and very quiet, located through a lovely courtyard and up stairs that are burnished with age. The kitchen and bath were well equipped and there was plenty of storage. It was a wonderfully comfortable space to return to every evening. My only wish was for a more powerful hairdryer...that tells you just how good this apartment is! The apartment could not have a better location. It is close toPlace des Vosges, several metro stations, as well as many cafes and bistros. Also, it is very comfortable and quiet, with a well-equipped kitchen. We definitely enjoyed our time there! Thierry was great to work with both before and during our visit. Fabulous rue des Francs-Bourgeois in the heart of le Marais.